Born in Birmingham, England, Albert Henry Fullwood came to Australia in 1881. He worked for 'The picturesque atlas of Australasia', travelled extensively around Australia and befriended other artists who worked for the Atlas, including Frank Mahony (with whom he shared a studio), Julian Ashton and Charles Conder. 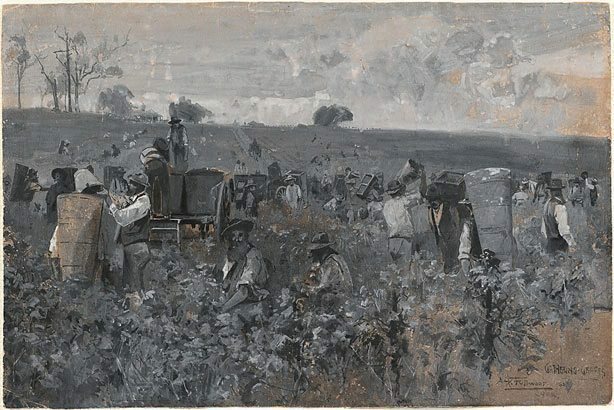 In the early 1890s Fullwood made etchings with Livingston Hopkins and painted at the artists' camp at Sirius Cove on Sydney Harbour, with Tom Roberts and Arthur Streeton among others. Fullwood left Australia for America and England in 1900, working as a black-and-white artist on various magazines in London. Like Roberts, Streeton and George Coates, he was an orderly at Wandsworth Hospital during World War I and an Australian war artist in France in 1918. He returned to Australia in 1920. Signed and dated l.r., pencil ".../ A.Hy.FullwooD 1894./ ...".